Posted 12/30/2014 by Sarah Beth Alcabes & filed under Abortion Rights/Reproductive Issues. 2014 has been a busy year for NOW! Our grassroots activists have been hard at work, refusing to stay silent as conservatives attempt to deny women their rights. From Alaska to Louisiana, New York to Texas, Rhode Island to Missouri, activists across the country are standing up for women! Activists started off 2014 by celebrating the 41st anniversary of Roe v. Wade, supporting a woman’s right to make her own decisions, and reaffirming the commitment to keep abortion legal and accessible. There were rallies, speak outs, and vigils across the country that drew over 1,000 participants. All year long, activists have been organizing to pass state-level ERAs. Activists in Illinois had tremendous success in pushing the ERA even further in the Illinois Senate! In North Carolina, there was also strong grassroots presence demanding an ERA; NOW activists spoke out at a Moral Monday and made sure women’s voices were heard. Photo courtesy of Massachusetts NOW’s Facebook page. In Rhode Island, Texas, and Florida activists brought attention to the pay gap as an intersectional feminist issue. Rhode Island NOW hosted an unhappy hour on April 8th– marking how far into 2014 white women must work to earn what men earned in 2013. In May, Florida NOW leaders organized The Inaugural Black Women Equal Pay Day to inform the community of the gap in pay not only among male and females, but about race-related income inequality, while advocating for greater respect toward women workers. In reaction to the outrageous Hobby Lobby decision in July, women and their allies around the country mobilized to protest. NOW chapters in Wisconsin and Florida held protests at their local Hobby Lobby locations, Massachusetts NOW held a rally at Boston City Hall Plaza. These protests made it clear that women will not stand for the religious right limiting access to health care and contraception. Activists across the country engaged in election efforts this November. 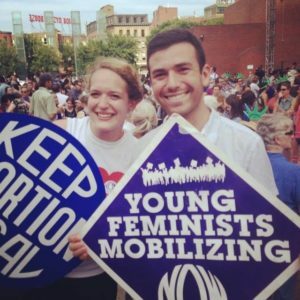 From voter registration initiatives in New York, to phone banking for feminist candidates in North Carolina, to canvassing and educating voters about anti-woman candidates in Louisiana, NOW activists did their part to participate in democracy this mid-term. Just a couple of weeks ago, NOW chapters and their allies across the country participated in actions at Walmart stores to show solidarity with #WalmartStrikers. Notable protests took place at Walmart locations in Indianapolis Indiana, Burlington Vermont, Middlesex New Jersey, Houston Texas, Takoma, Thurston, and Seattle Washington, and Anchorage Alaska. Special shoutout to Brevard County NOW, an outstanding Florida chapter who has hosted a range of important events and panels. In October they hosted an event for Domestic Violence awareness month, asking participants to donate non-perishable food items to their local Women’s Shelter. Additionally they have put on events discussing Human Trafficking and how to fight it on a local level, the experiences and struggles of immigrant women, and honoring female veterans. With your help, we can provide even more tools to our activists in 2015 to fight for women’s rights across the country. By making a gift to NOW this holiday season, you can help us prepare for aggressive attacks on women’s rights in the year ahead. With your help, we’ll be able to give our grassroots activists the training, information, and tools they need to fight these extremists.